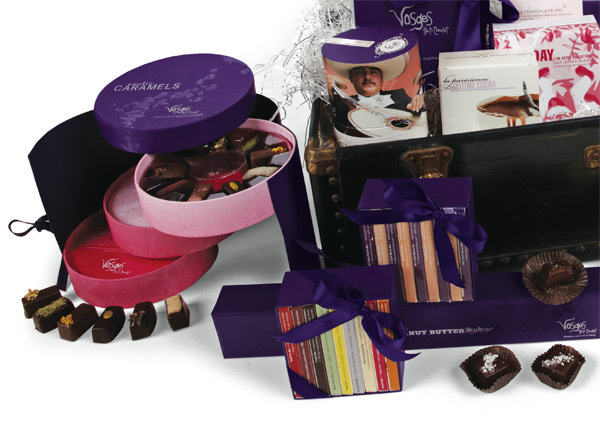 On the most indulgent of chocolate gifts i’ve yet to come across… Vosges’ “Travel The World Through Chocolate Steamer Trunk” is quite the spectacle. 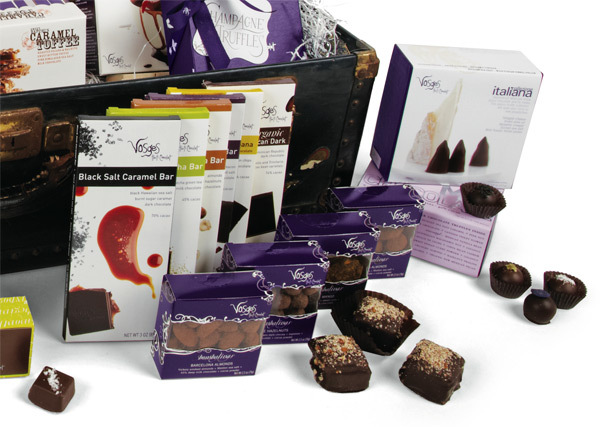 Amazingly, every “vintage steamer trunk filled with every truffle, caramel, bonbon and comfort food in the Vosges Haut-Chocolat line. 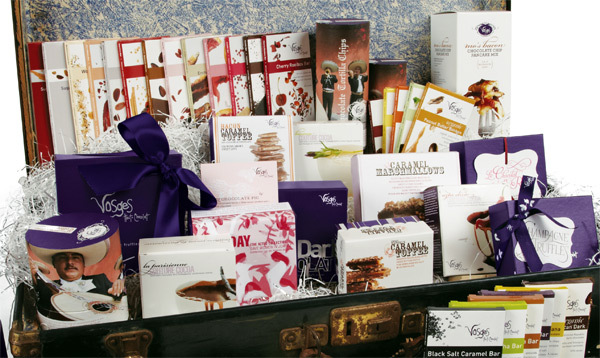 This grande gift was inspired by Katrina’s creative process and the Travel the World through Chocolate theme. Each vintage steamer trunk was hand selected by Katrina and includes notes and musings about her creative process and a map to plot your “travels” with each chocolate bite.” Insane, no? But can you imagine one of these appearing at your office? House? Party? Wow… see more close ups as well as a full listing of products included on the next page! 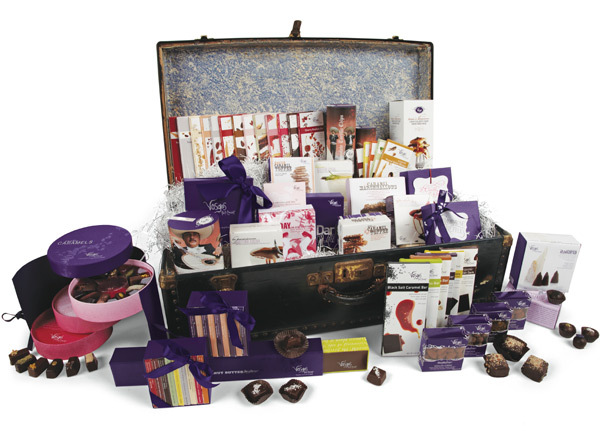 Each Steamer Trunk includes: 16 piece Exotic Truffle Collection, 12 piece Krug Champagne Truffle Collection, 16 piece Holiday Truffle Collection, ½ lb Bapchi’s Caramel Toffee, 1 each of our entire Exotic Candy Bar Line (24 three ounce bars), 9 piece Peanut Butter Bonbons, 9 piece Caramel Marshmallows, 9 piece Aztec Truffle Collection, 9 piece Dark Truffle Collection, 9 piece Milk Truffle Collection, 1 each of our Couture Cocoa Line (3 eight ounce boxes), ½ lb Red Fire Toffee , ¼ lb Bacon Toffee, 1 Flying Bacon Pig, 1 each of our Baking Mix Line (5 flavors), 1 Mini Exotic Candy Bar Library, 1 Mini Bacon Library, 9 piece Collezione Italiana, 1 each of all our Bombalinas (4 flavors), 36 piece Exotic Caramel Collection, 12 piece Le Chocolat en Rose Collection, 6 ounce Red Fire Tortilla Chips & 6 ounce Red Fire Pecans. Because the trunks are vintage and purchased individually, each varies slightly in size and style. Most are approximately 30” L x 15” W x 11” H and weigh close to 50 pounds. Looks pretty good, but wow! Over $1,000! Did you buy this, or was it given to you for the purposes of review? If youve got this trunk hanging around yr office im ready to trade our hawaii organic equal and/or a couple of andy warhol originals and/or a case of my favorite poets. This is what ive got to offer.